NORTH Korea (北韓) reopened a longclosed border hotline with South Korea (南韓) on 3 January, a day after Seoul (首爾) proposed high-level discussions amid a tense standoff over the North’s missile and nuclear programmes. That followed North leader Kim Jong Un’s (金正恩) New Year address, in which he said he was open to speaking with the South and would consider sending a delegation to the Winter Olympics (冬季奧運會) to be held just across the border in Pyeongchang (平昌) next month. Kim ordered the reopening of the hotline at the truce village of Panmunjom (板門店). Officials on both sides checked the line and conducted a conversation for about 20 minutes, the contents of which were not disclosed. The hotline was shut down by the North on February 2016, in retaliation against the closing of a border factory town that was jointly operated by the two Koreas. South Korea’s presidential office said it welcomed Kim Jong Un’s New Year speech, Yonhap news agency (聯合通訊社) reported. 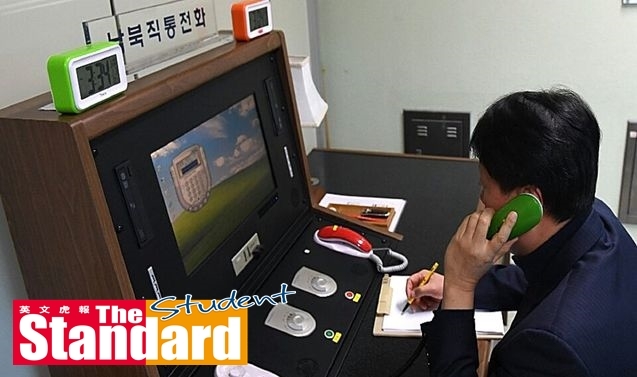 South Korean presidential spokesman Yoon Young Chan (尹永燦) said the North’s decision to open the hotline had “significant meaning” because it could lead to constant communication. China’s Ministry of Foreign Affairs (中國外交部) said both Koreas should use the Olympics as an opportunity to improve ties. Un’s sincerity if such talks happen, unless they contribute to denuclearising North Korea. “If the two countries decide that they want to have talks, that would be certainly their choice,” State Department (國務院) spokeswoman Heather Nauert (諾爾特) told reporters. While appearing to open the door to taking part in the Winter Olympics, Kim also warned that he would push ahead with “mass producing” nuclear warheads in defiance of UN sanctions. He said that he has a ‘nuclear button’ on his desk ready for use if North Korea is threatened. Fresh talks have been conducted since the reopening of the hotline. Both Koreas have reached an agreement to allow the North to send a delegation of athletes and supporters to the Winter Olympics.